Today, Facebook reminded me that I published a post on gratitude on this blog 2 years ago. At that time, I was in the throes of my prostate cancer treatment and just starting to learn more about meditation. It had been a pretty difficult time for me, but no matter what the circumstances, I had plenty to be grateful for. 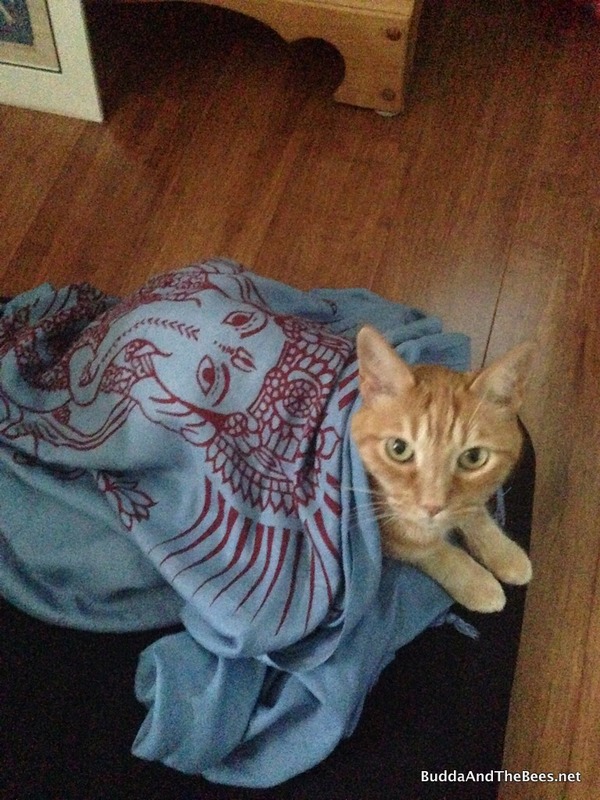 In that post, I talked about going to a meditation intensive and giving a talk on gratitude. A lot has changed in those two years. At the time of that post, I had finished my radiation treatments and I was under the thumb of the Evil Lord Lupron – a drug that eliminates the testosterone that feeds the prostate cancer. Hot flashes, weepy episodes, ED, loss of memory – it all just sucked. (I have a much better appreciation for my wife going through menopause now). While I still have some lingering side effects (I don’t do math in my head anymore), I’m happy to say that I’m cured. I’m grateful for the openness that I felt during my flirtation with womanhood. My heart was much more open then than it is now (something I’m working on though). My kids knew I was back to my old self when I started cursing out drivers on the road again. But even there, these days, I just let it go. It takes too much energy to be angry. Two years ago, I went to my first meditation intensive at the Eldorado Mountain Yoga Ashram. That was the beginning of a new spiritual path that continues to this day. Since that day, I’ve started a practice of meditating twice a day (morning and evening) and have also become a certified Shambhava Yoga Meditation Teacher. One of the things I remember clearly from that meditation intensive is a young man, Govinda, who talked about his sankalpa of doing a gratitude practice every day for a year. I told Diana that we should try that. To this day (and probably for the rest of my life), we end every meditation with a gratitude practice. 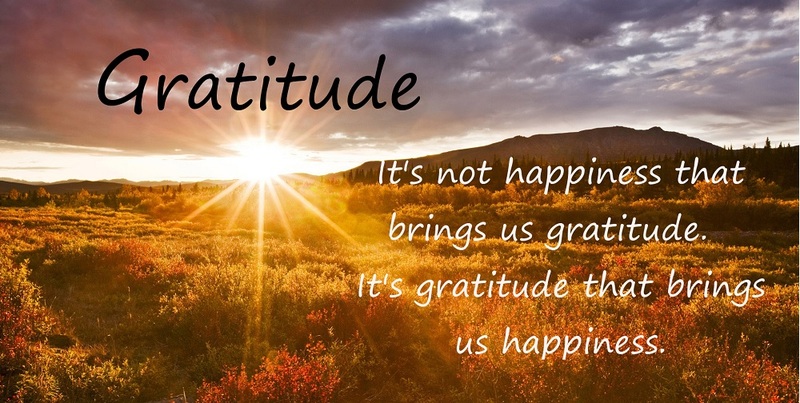 As I tell my students – gratitude begets gratitude – the more you are grateful for what you have, the more you exude that gratitude and other people feel that energy. Every day, just for a minute or two, stop and think about what you have to be grateful for. It’s a powerful experience. 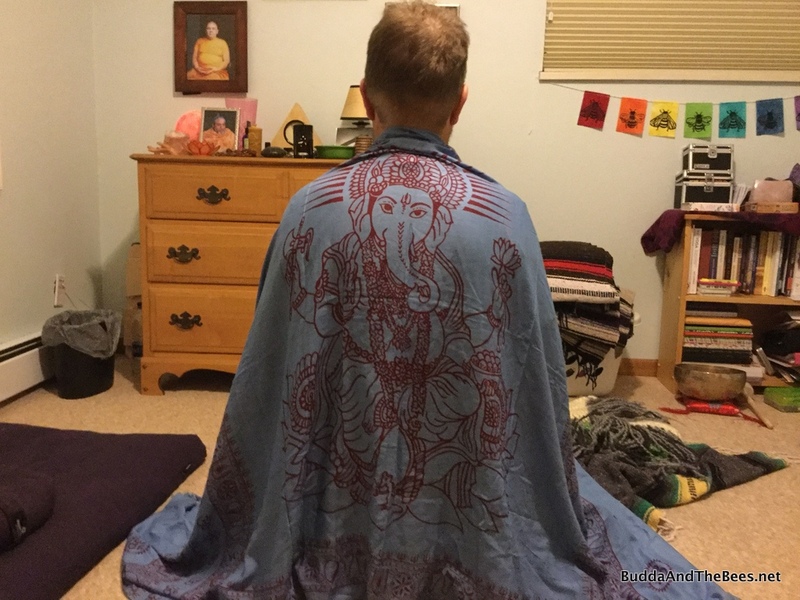 I’ve since left the church I was attending and am now a member of the Shambhava Yoga community. I still cherish my time at the church and keep in contact with the many friends who met over the past 20 years. I love the new friends I’ve made in the sangha and look forward to new journeys with them. In that previous post, I talked about how sore I was from sitting all day. Recently, I attended a 4 day meditation retreat up at Shoshoni Yoga Retreat. Even though I am a more experienced meditator, I wanted to deepen my practice and connect with the people up there. Let me tell you, 4 days of meditating really takes a toll on your knees. 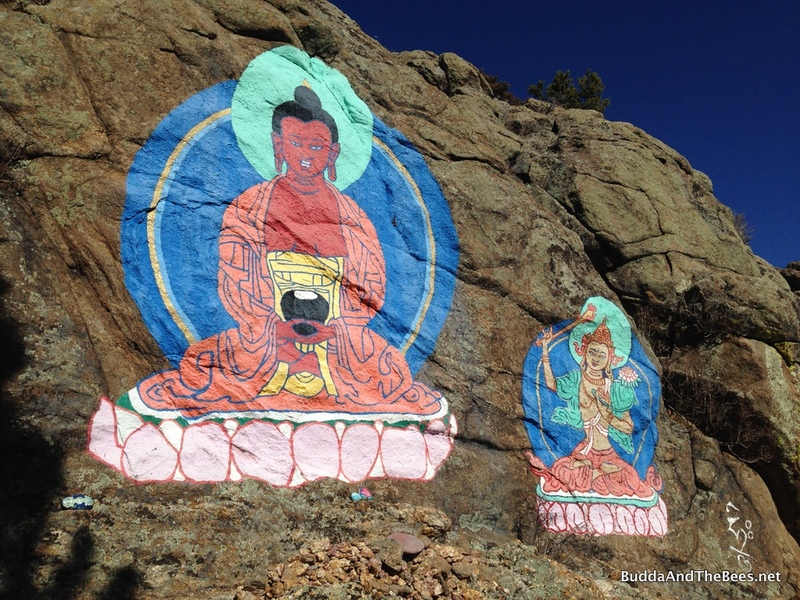 I skipped one of the sitting sessions to do a walking meditation to the Buddha rocks on the property. The weekend met all my expectations. I met some wonderful people who were there for the retreat, connected with the staff up there and deepened my desire to grow. If you are looking for a place to grow, I highly recommend spending some time at Shoshoni. At one time, the folks up at Shoshoni tried keeping bees. They had a top bar hive and a couple of Langstroth hives. However, being at 9000+ feet with cold winters and wicked winds, it was pretty hard to keep the bees alive. Even feeding them and trying to make protection around the hives didn’t work. My friend Karvari, who had lived up there at one time, told me that they still had the equipment up there but weren’t using it. I thought maybe I could help them out and see if we could make a go of it, but now just wasn’t the time for them to try again. They offered me the equipment, so I brought home the remaining Langstroth hive (Karvari had already taken the top bar hive). Our plan is to set up the top bar hive in a new bee yard that I’ve acquired and the Langstroth hive in the Left Hand Hive yard. I plan to donate any honey from these hives to the ashrams. So, this year, I’m grateful for my cure, my meditation practice, the prospect of new bees and this wonderful world we have before us. Even in these troubled political times, there is still plenty to be grateful for. Every day, the sun comes up and a new day is presented to us. Sit back, be present and look for the wonder that is there. Glad you are feeling so well, Don. I loved reading this; I am surprised that throughout high school, I never knew how great a writer you were! Thanks for the inspirational thoughts. Happy Thanksgiving to you and your family. Thanks, Paula. Must have been all those book reports in Ms. Weinstein’s class. 😉 Happy Thanksgiving to you and yours! 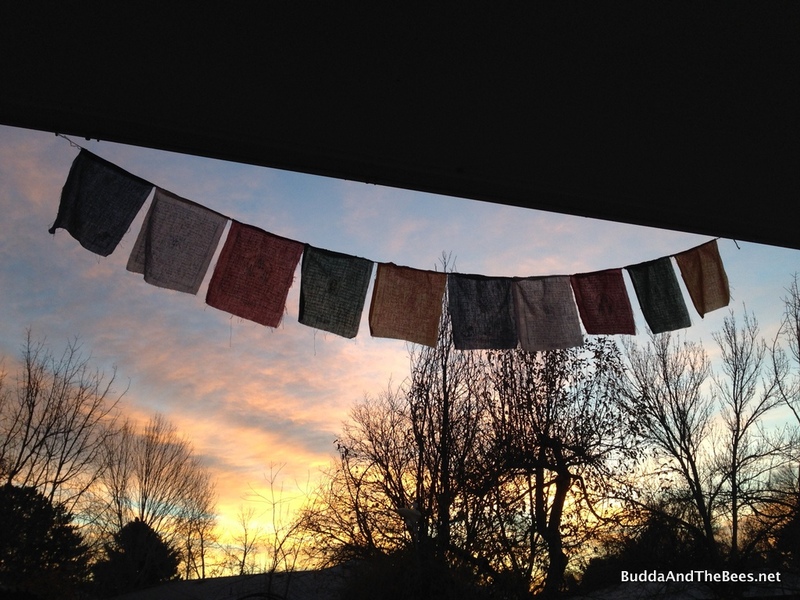 Beautiful post, and I love your bee prayer flags!! Where did you get them?! I wonder if you could have the hive at Shoshoni during the summer, and then bring it down in the winter? I just went to an Apitherapy conference, and one of the MDs there said he meditates in front of his hives. I’m thinking of doing this myself with my home top bar hive. I did offer a summer residence for the hive up there, but right now, the person who would be tending the bees has too many balls up in the air. Maybe in the future. A book that I’ve been recommending to friends who are looking for a spiritual connection with bees is “Song of Increase” by Jacqueline Freeman. I gave a copy to the person up at Shoshoni. I also just love her descriptions of the roles of bees – especially drones – in keeping the colonies going. The prayer flags are from arubymoon (http://www.arubymoon.com/). She has all kinds of designs and has displays a most craft fairs. They sell the bee ones at Harlequin’s Gardens which is where I got mine originally. Here’s a post I did about them (http://buddhaandthebees.net/blog/2016/04/04/bee-flags/). Make sure you wear a veil if you sit too close – a sting to the face would not help your meditations! 😉 I have a bench about 10 feet in front of my hives that I sit on to watch and meditate on the comings and goings of the bees. It’s in front of a fence, so I’m not in the flight path.